This new ecommerce website was a different type of project due to the fact that the products are custom made to order. With this in mind we built in a complex set of options so that customers could order with all the options. View the site. 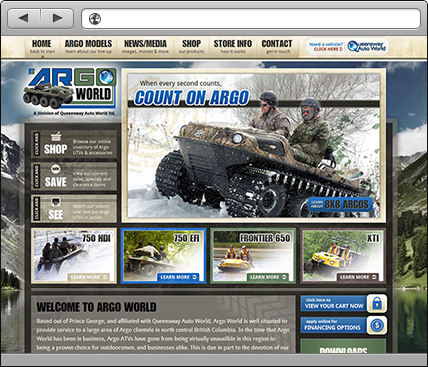 A unique outdoor theme characterizes this new website for Argo World. They are the largest dealer for Argo in Northern and Central BC. This type of recreational vehicle is used by hunters and on industry worksites. View the site. 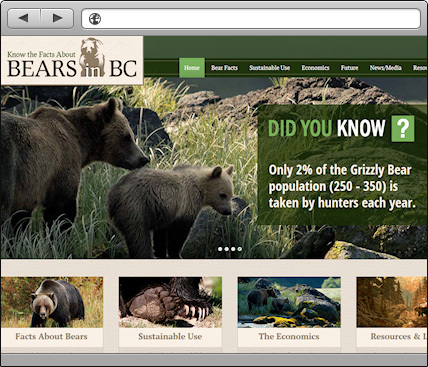 The Guide Outfitters Association of BC needed a website to showcase the many conservation efforts of GOABC when it comes to bears and to educate the public on how hunting in BC is carefully controlled to ensure population stability. View the site. 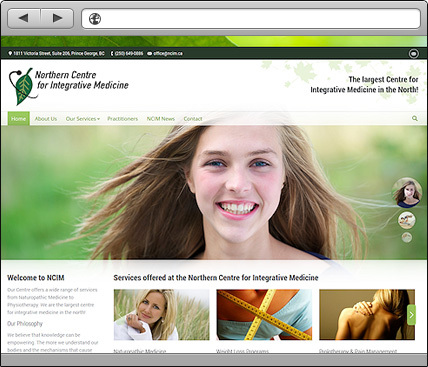 The Northern Centre for Integrative Medicine needed a website makeover to showcase the many services that they provide. Part of the project was highlighting the health blog which had grown to over 77 posts. Responsive Wordpress Site. View the site. 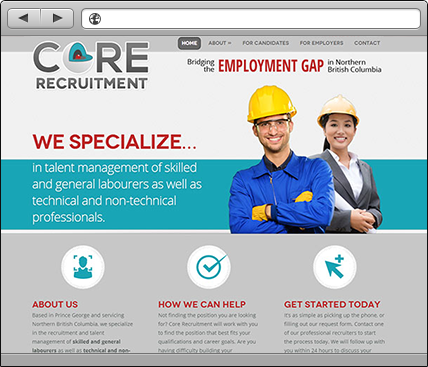 With a great domain like RecruitBC.com, Core Recruitment was already off to a good start. We gave them a responsive wordpress site that is easy to manage and mobile friendly. We designed the logo and brand as well. View the site. been happily designing unique professional websites for over 20 years. We enjoy the challenge of marketing businesses online and keeping up with the latest industry trends. 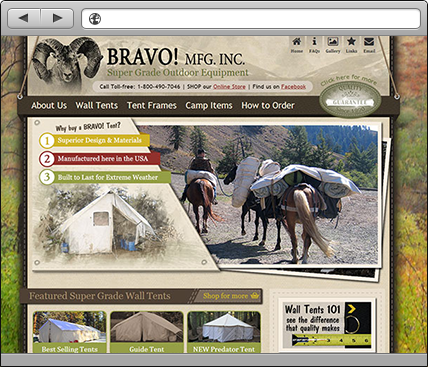 web services including design, shopping carts, product catalogs, content management and web training. We have also added several graphic and print media services. best way to choose a designer is by their portfolio. We encourage all our clients to have a look at our work to ensure that our design esthetic and style match their vision for their website. about getting your business noticed on the web with a professionally designed website, or need a a graphic designer to create cohesive marketing materials, give us a call. Consultations are free! Although your website may look amazing on a big screen, it may be costing you by turning away mobile viewers. Maximize your potential for mobile traffic with a mobile site from PG Moblie. It runs off of your existing website, so setup is easy. Mobile users account for a significant amount of online traffic. Make sure that users can get the information they need about your business on the go. Choose one of our packages or contact us to learn which option is best for your site. With more and more customers browsing the web from mobile devices, it is becoming more and more important to create websites that can be viewed on smaller screen sizes. 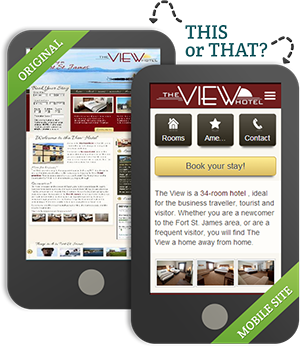 A responsive site is easy to view and navigate on all screen sizes and is touchscreen-friendly. This is just one of the solutions for mobile devices that we offer. Call or contact us to discuss your options. IT'S A VISUAL WORLD! Research has shown that uploading and sharing of photos and graphics on social media has become one of the top 10 tasks or activities for desktop, mobile and tablet users. Pinterest, a visual medium, is currently the fastest growing social media network. This is where infographics and visual media come in. Infographics are a fun and quick way to learn about a topic without a lot of heavy reading. There are many different styles of infographics and data visualizations but the ULTIMATE goal for all Infographics is to be SHARED. 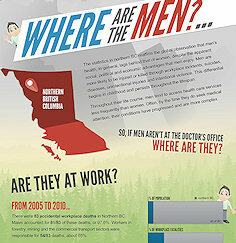 Here is the full version of our "Where are the Men?" infographic.